Headed up this morning to Pinnacle Saddle with the promise of potentially cool sunrise skies. I went to bed (backseat of my car) with clear skies and got up around 5am and clouds were starting to move in. I started hiking around 530am and got to the Saddle by a little after 6. 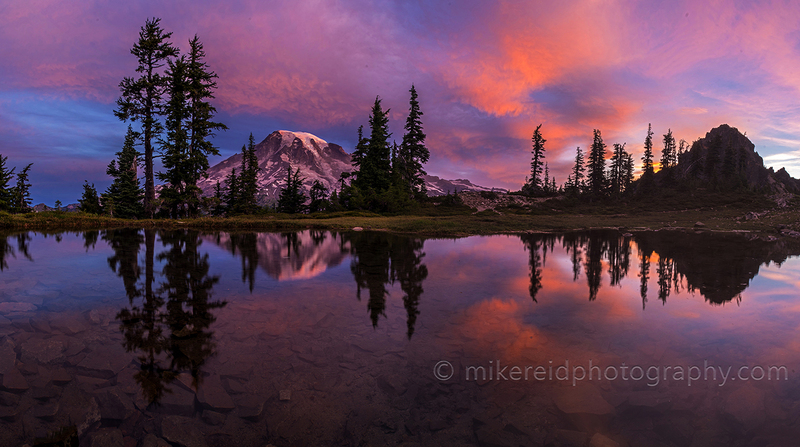 The sky was starting to come together with pinks and purples and I found the tarn for a nice Rainier reflection. At this point it had totally melted out which allowed for a panorama. The recent rains also gave a nice clear shot of Adams and Hood to the south. Hiked back down as the rain moved in around 745am.